In his latest PHE Screening blog post written for his fellow GPs, Dr Jim McMorran looks at primary care issues relating to sickle cell and thalassaemia (SCT) screening. The SCT programme, the first national genetic screening programme in the NHS, provides primary care with opportunities to develop practice in genetics. As GPs, we are ideally placed to explain the significance of carrier results for individuals, families and across generations. Antenatal screening for sickle cell disease and thalassaemia aims to offer informed reproductive choice by identifying parents who are genetic carriers and at risk of having a baby that inherits the condition. Early screening (target 10 weeks’ gestation) is critical to this choice, including the option to terminate pregnancy in the first trimester. The antenatal SCT programme uses 2 approaches depending on the prevalence of sickle cell disease locally. An FOQ, followed by a blood test for sickle cell and other haemoglobin variants, only for those deemed at higher risk. Screening by a blood test for sickle cell and other haemoglobin variants, and a FOQ. The first method is used in low prevalence trusts, the second in high prevalence trusts. Low prevalence trusts are those where less than 1% of the booking bloods received by the laboratory are screen positive. High prevalence trusts have a figure greater than or equal to 2%. Trusts with a prevalence between 1% and 2% are considered borderline and should continue to use their current approach (algorithm). 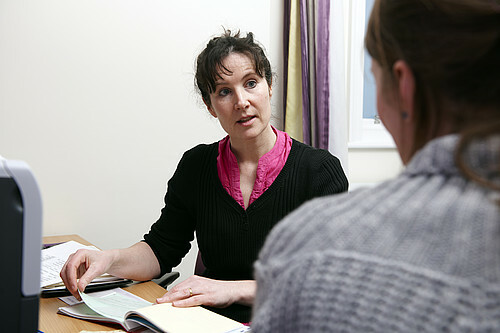 When discussing fertility treatment, GPs should counsel couples and offer them testing before treatment. This reduces the risk of a couple going through IVF treatment with no idea of the risks and then facing potentially distressing choices following a positive antenatal screening test for sickle cell disease or thalassaemia. We should offer carrier testing, using the FOQ, either in the practice or by referral. Ask for a full blood count and haemoglobinopathy screen and state this is a pre-IVF request. Send the completed FOQ to the laboratory with the sample. Alternatively, check if the IVF clinic can offer the test. If the woman is already pregnant after fertility treatment, encourage her to access screening early – before 10 weeks. Screening for sickle cell disease is offered as part of newborn blood spot screening. It identifies babies with sickle cell disorders, beta thalassaemia and sickle cell carriers. It does not reliably detect other thalassaemia conditions or thalassaemia carriers. As GPs we provide a vital link between newborn and antenatal screening. Through age appropriate discussion we can ensure that young people grow up understanding the reproductive significance of their carrier status. SCT carrier status can occur in any population. However, it is more common in people with ancestry in Africa, the Caribbean, the Mediterranean, India, Pakistan, South and South-East Asia and the Middle East. The SCT programme has developed the Family Origin Questionnaire tool to determine the likelihood of a person being a haemoglobinopathy carrier.